After returning from the Copenhagen Expedition of 1807, the 28th Foot were sent to Portugal the following year. On 24th October 1808 the army under Sir John Moore marched into Spain to support our new Spanish allies who had risen against the French. Moore’s strategy was to cut Napoleon’s communications with France as the French army advanced into southern Spain, driving all before it. Moore’s success ensured that he did not go unnoticed, and Napoleon turned about, anxious to defeat the “English leopard” in the field. Moore was in serious danger of being surrounded and destroyed in Northern Spain. He saw retreat as his only salvation and on Christmas Day began the Retreat to Corunna. The 28th were in the Reserve Division which was commanded by their old colonel, Sir Edward Paget. (Moore, of course, had commanded Abercrombie’s Reserve Division, including the 28th, at Alexandria). Paget’s Reserve Division also included Moore’s “Shorncliffe Boys”, the 43rd and 52nd Light Infantry, and the 95th Rifles, later to form the nucleus of Wellington’s Light Division. The Reserve Division made up the rearguard of Moore’s retreating army and endured considerable hardships through the 220 mile retreat to Corunna. The severity of the winter weather, lack of food, clothing and shoes led to a breakdown in morale and discipline throughout the greater part of the British Army, with the accompanying women and children of the army dying in their scores. “The Guia, an insignificant stream, but at this season rising in its bed, runs along the base of the sloping hill upon which Calcabellos is situated, at the distance of from four to five hundred yards, and passing under the narrow stone bridge, winds around the vineyards in which the 52nd regiment were posted. At this bridge the light company, as has been said, were posted until everything belonging to the reserve should pass over; and, before this was entirely accomplished, our cavalry (at first preceded by the 95th, whom they passed through) came galloping down to the bridge, followed closely by the enemy’s dragoons. The enemy’s advance being seen from the high ground in our rear, the battalion bugles sounded our recall; but it was impossible to obey, for at that moment our cavalry and the rifles completely choked up the bridge. Robert Blakeney, “A Boy in the Peninsular War”, 1899. 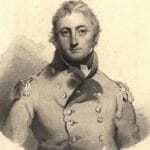 Moore, too, like his predecessors Wolfe and Abercrombie, died in battle at the head of his army at Corunna.